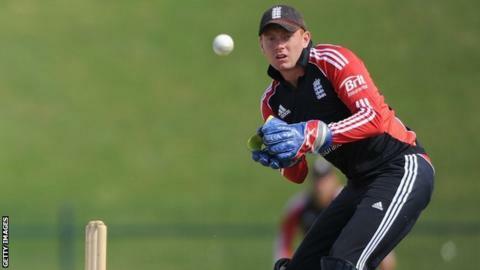 England wicketkeeper Jonny Bairstow has been ruled out for up to six weeks after breaking a finger. The 24-year-old fractured a digit on his left hand after attempting to take a delivery from Liam Plunkett in Yorkshire's three-day friendly against Northants. He is now set to miss Yorkshire's first four County Championship games of the season, starting on Sunday at Somerset. Yorkshire coach Jason Gillespie said: "It is a devastating blow for Jonny." The former Australian fast bowler told Yorkshire's official website: "He has been working incredibly hard to put in some strong performances for Yorkshire during the early part of the season to enhance his England credentials. "It is a great shame for him and I know that he is really disappointed with the news." England's first Test of the summer is against Sri Lanka at Lord's on 12 June, and Gillespie said: "He will be working hard on his rehab and we remain hopeful that if the fracture can heal quickly he could be back sooner than six weeks. "It was an innocuous injury. In these circumstances Jonny would take that ball 100 times without any problems. Things like this can happen in professional sport. "It is how you deal with it that matters most and I know that with his positivity, he will be chomping at the bit to get back to playing for Yorkshire as soon as possible." Bairstow replaced wicketkeeper Matt Prior for the fourth and fifth Tests during last winter's Ashes tour, which England lost 5-0. The 24-year-old took 10 catches across two Tests, but struggled for runs, scoring 10 and 21 in the fourth Test and following up with 18 and a duck in the next.